The Big Wobble: "Spectacular!" Mount Sakurajima, Japan, ejects ash and smoke 5,000 meters in the air. 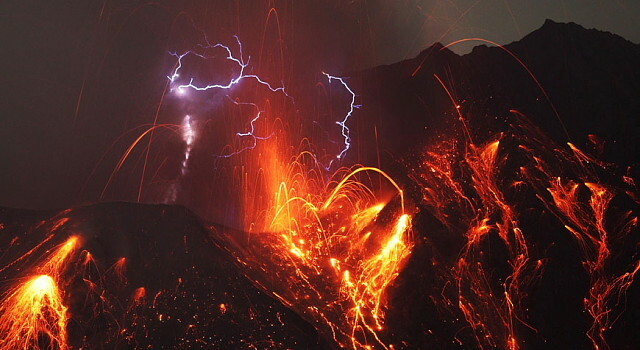 Mount Sakurajima erupted early on July 26, belching out a massive column of smoke rising 5,000 meters in the air. The eruption occurred at 12:02 a.m. at the mountain's Showa crater. This is the first time that the active volcano in southern Kyushu has spewed out a smokestack that high since an eruption on Aug. 18, 2013, according to the Kagoshima Meteorological Office. It marked the 47th eruption this year, and the observatory is warning residents and travelers in the area that traffic accidents may occur because of the falling ash. The Japan Meteorological Agency continues to keep Sakurajima on an alert level of "3," which closes off the entire mountain except for residential areas along the coast. It has been at that level since February.